Screenshot of the tunnel optimisation tool. Remember the ingenious civil engineering tool that British consultancy ARUP has developed for CERN’s FCC and that is also being used for site-specific planning of the ILC? That thing where you can play around with shafts, tunnels and rock formations without leaving your desk? It’s been shortlisted for a prestigious award, so keep your fingers crossed. Every year, the Management Consultancies Association (MCA), the representative body for management consultancy firms in the UK, hands out awards in various categories to British consultancies. 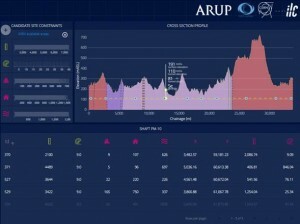 ARUP and their “Tunnel Optimisation Tool” are shortlisted in the category “Digital and Technology” and are up against a programme that models public transport in London, the digitisation of the UK’s rail system or the planning of a new super-warehouse for a big supermarket chain. “We were interviewed in London with two colleagues from ARUP,” says CERN civil engineer John Osborne. “It went well, but it was a bit like the TV show Dragon’s Den, where entrepreneurs get grilled by potential investors about their business ideas.” The winners will be announced in April.